I love games! Since I started teaching, I’ve always loved making review and practice fun in my classroom. Students love games, too. With everything students are expected to learn and remember each year, I believe spiraling concepts is a MUST. 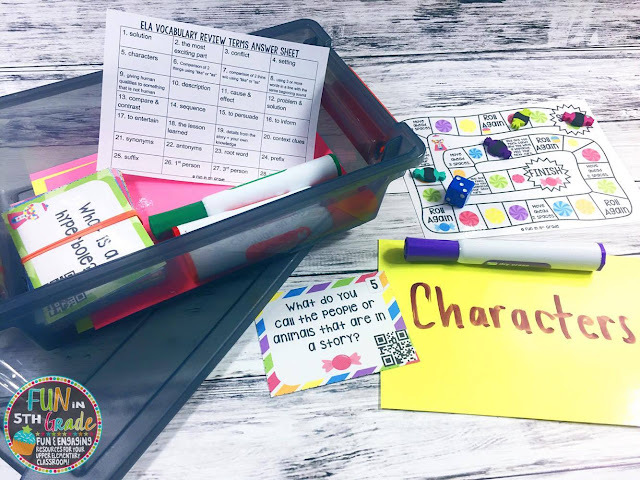 So, why not make the review FUN by using games to engage and practice?! Spiraling is when you take concepts that were previously taught and you sprinkle them in here and there to keep them fresh in your students’ minds. It may be in the form of a center, or station, in small group or even for homework/independent work. (More on all that later.) Spiraling is NOT taking a chapter test and then moving on to the next chapter without ever going back to the concepts from the other chapter. I started using more games when I could see my students weren’t engaged in reviewing from a packet or a worksheet or the book. They just weren’t trying and when I would look at their papers many were answers incorrect. I really felt this defeated the purpose of a review. I felt like the reviewing may have actually been hurting instead of helping and my students weren’t retaining the information like I’d wanted them to. But we had to keep moving due to the pacing guide and staying on track with the rest of the grade level. 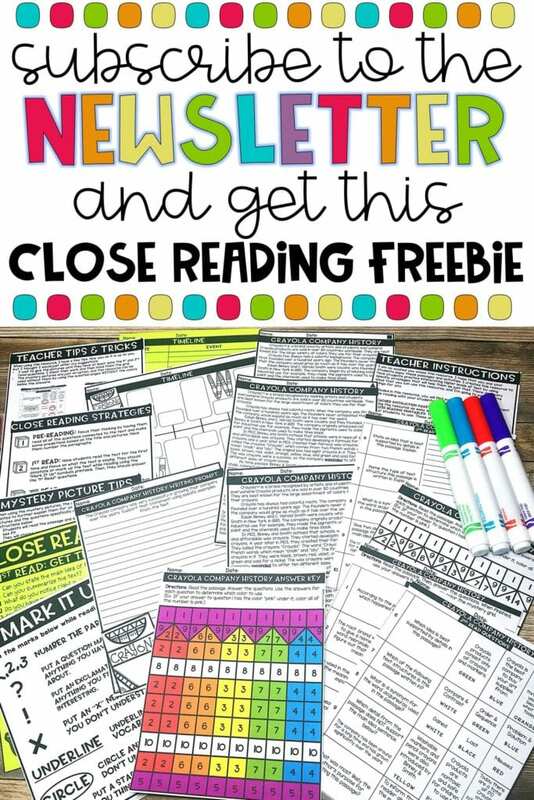 ***Insert fun review games (click here to see the games I use in my classroom) that I would spiral throughout the year and they were retaining the information. I use A LOT of U-Know and Task Cards to help make review FUN! Yay! I’m serious. Some of my students were actually thanking me for making it fun and they said they were finally remembering things better. You can even sign up below to get two FREE U-Know games! 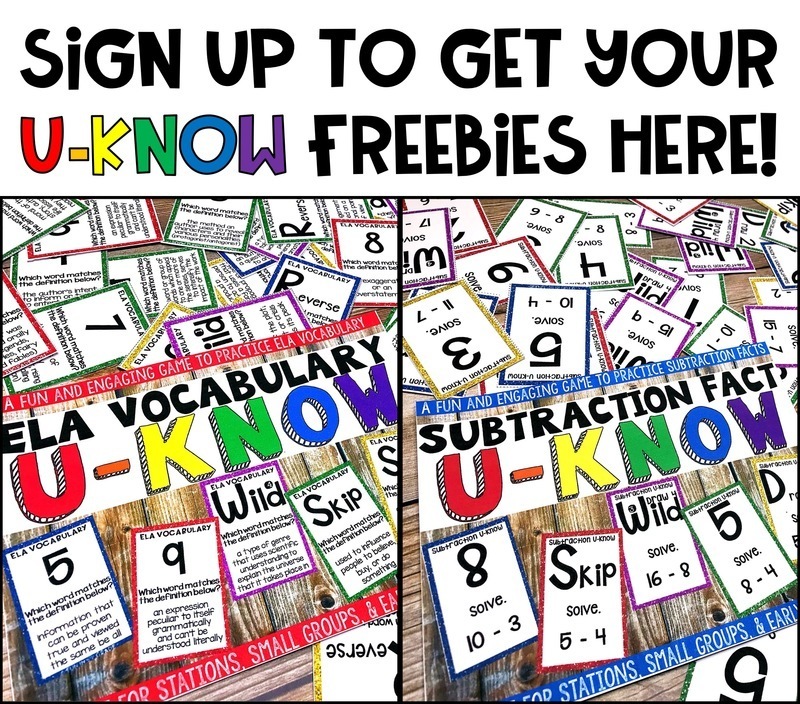 Sign up here to get your FREE U-Know Games! 1. It helps students retain information. Like I said, the students are more engaged in their learning if it’s fun. So, using games will help them practice and retain information as you move to new concepts. The more they practice, the better they will remember for the rest of the year. 2. It’s important for building a foundation. Many topics build on each other throughout the year. You want your students to use the information you’ve already taught them, as well as, the current topics you’re focusing on. 3. It helps the students that may not have fully understood it the first time. Let’s face it. Ideally, we wouldn’t move on from one concept until all of our students have mastered it. But, that unfortunately can’t happen most times due to pacing guides and alll of the standards we need to cover. Spiraling helps those students get to mastery level with practice and FUN! 4. It makes students more confident in their abilities. The more my students practice with games, the more confident they get on their tests and quizzes. They even start participating more in class discussions. Yay! 5. Using games to spiral makes it fun! Making it fun is the key. If students WANT to play, then everyone wins! They ask to play when they finish their work early, they ask to take a game to lunch, they even ask to play during indoor recess! I mean, really, what more could a teacher want?! There are many times in the day that you could use games to spiral. You would have to look at your schedule and what you already do and see where you could use spiraling. Some of the different way I have seen teachers spiral I have listed below. ➽Whole Class: Teacher breaks students up into groups and then gives each group the same game or activity. Or each group has a different activity and then you have the students rotate around to the different stations throughout the class period or throughout the week. This would be great for a review day before a test. I like to use different stations. One is usually our current topic, one for multiplication facts, and two stations of spiraled topics that I want to refresh in their minds. ➽Small Group Centers: Teacher is meeting with a group of students and the rest of the students are working in centers. Make one or two of the centers a game. I use U-Know a lot in centers. (Click here to see them.) My students LOVE U-Know! BONUS: Since I teach them the game once in the beginning of the year, I can then just switch it out to the many different topics. It makes it easier since they already know the game. U-Know games come in MANY different math and language arts topics. It’s played similar to UNO but with a twist! Students must answer the question on the card correctly or they draw two. This helps them try harder to get the correct answer and the other students are all over checking to make sure they were correct. I also use task cards a lot here, too. Task cards are great because you can pretty much put them with any game and you have a brand new way to use them. Put them with Candyland as the cards and students must answer correct to pick a card or put them with a mini basketball game where they get to shoot for bonus points if they get the answer correct. Or check out some of my task cards (Click here to see my task cards.) that come with game boards and all you need is a die and games pieces and you’re all set. ➽Independent Work: When students have an assignment they need to complete independently, you could always have them play an independent game with a deck of cards. Or they could be working on a set of task cards that focus on a variety of topics they need to review. You can mix and match task cards sets…just be sure to not have duplicate numbers. ➽Homework: I don’t really give much homework but I do have mini sets of games that I print out. (Click here to see how I do that.) So students can sign out the games and practice at home with their families. 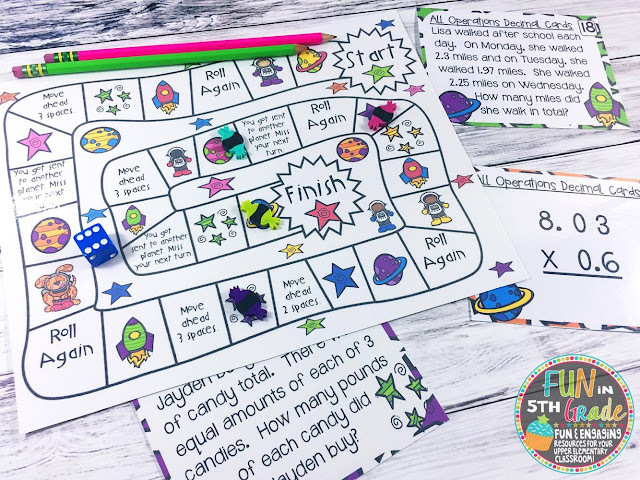 ➽Early Finishers: You could have games or activities ready to go and as students complete work in the classroom, they could find friends that are also done and play a game. Also works as a great motivator to not waste time and to get work done. Here’s a set I put together for the kids. This is my ELA Vocab Review Cards. I printed everything smaller so it would fit. See how I do that in this post. ➽Lunch/Recess: At my school, students need an activity for when they finish eating their lunch. They can bring a book to read or something else to do. My students LOVE taking my games (Click here to see all of my games) so I set up little bins with mini dry erase boards, mini game pieces, dice, and cards for them to grab for playing at lunch. They stay out of trouble and they are learning. Win-WIN! I hope you were able to find some useful information so that you can spiral important conceptsusing GAMES! 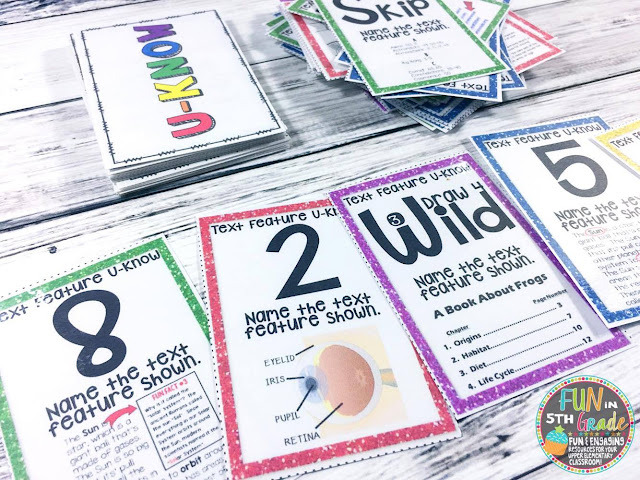 If you want to see more of the games I’ve made to play in my classroom, please visit my TpT store. You can even try out two U-Know games for FREE! Just sign up below.